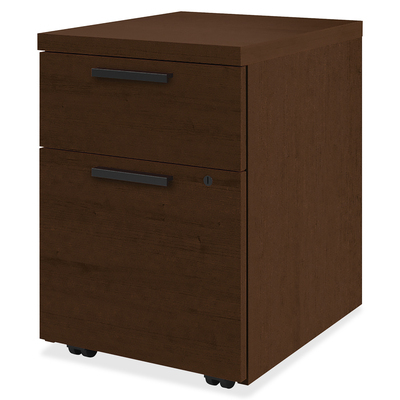 Mobile pedestal belongs to the HON 10500 Series Desking that features well-built, cost-effective wood furniture that is the perfect solution for a growing business. Freestanding pedestal with smooth, flat edges can be used alone or fits neatly under 20" to 36" deep shells for desks, returns and credenzas that are at least 29-1/2" high. Easily roll the pedestal where you need it on hidden 2" diameter casters. Use the box drawer and file drawer to stay organized and store supplies and hanging files. File drawer includes built-in hangrails for letter-size and legal-size filing. All drawers lock with a core-removable lock and roll smoothly on ball-bearing suspension with full extension. Durable, thermal-fused, Mocha laminate resists scratches and stains. Pedestal is certified by SCS to be in compliance with specific indoor air-quality emission requirements and meets or exceeds ANSI/BIFMA and ISTA performance standards.